Teachers are the backbone of our society by educating our youth. They help form a strong educational foundation for students as they move out into the world and create their own careers and businesses. Teachers do incredible things in the classroom, but they also work in other capacities, such as those in special education, administration, curriculum planning and more. These individuals work together toward the shared goal of giving every child and young adult the education they deserve. Those who are interested in earning an education or teaching degree can find the information they need regarding programs, financial aid, credentialing and in-depth resources in our guides. Dr. Chester Goad is a university administrator and graduate instructor, a former K12 principal and teacher, former US Congressional staffer, author, blogger and speaker. He is co-author of Tennessee's “Dyslexia Is Real" law and has presented on disability and leadership-related topics from Appalachia to Africa. Currently he sits on the Editorial Review Board for the Journal of Postsecondary Education and Disability, and the Board of Directors for the Association on Higher Education and Disability. All institutions of higher learning recognize the importance of education – that’s why there are so many programs that lead to an education degree. To narrow down the wide range of options, we offer the following rankings, based on things that matter most: tuition, student-teacher ratio, graduation rate, number of programs available, and more. Northeast Mississippi Community College's associate elementary education degree is a two-year program that offers adults a foundational training that prepares them for a four-year education degree. The school's early childhood education technology degree provides adults with a basic teaching foundation while emphasizing the role that technology plays in early childhood education. Advisors that education majors are assigned help students pick classes that lead to the two-year degree. Classes that advisors help students select also transfer toward a bachelor's education degree. A total of 62 semester hours are needed to graduate. The lowest GPA that students can earn to graduate is a 2.0. Core education and teaching classes at Coahoma Community College are offered through the child development program. Completion of the early childhood development technology program and related work experience prepare students to take the Child Development Assistant licensing tests. After passing the exams, students could teach at the preschool and infant-toddler levels. Some early childhood development technology courses may be taken online. Students log into Canvas to get assignments while taking online courses. Broader opportunities to learn from instructors in person takes place at the college's educational outreach facilities which are located throughout five counties in Mississippi. Eastern Wyoming College accepts high school graduates, international students and transfer students into its two-year education degree programs. An Associate of Arts in Elementary and Secondary Education and an Associate of Arts in Early Childhood Education are types of education degrees awarded at the college. The child development certificate is a two-semester program. More than 100 instructors teach at the college. Students are encouraged to meet with an advisor before registering for classes to increase the likelihood that their classes will transfer into four-year degree programs. Adults who are committed to educating children at the early childhood and secondary levels could get an Associate of Arts in Elementary Education degree from the College of Southern Idaho. Bilingual elementary education, educational assistant, special education, kindergarten through high school and secondary education are other areas that the college awards undergraduate credentials in. Technical certificates are also conferred in the education assistant program. Curriculums in the programs meet core Idaho teaching guidelines. In programs like bilingual elementary education, the first two years of study are completed at the College of Southern Idaho and the last two years of study are completed at Boise State University. Faculty at Itawamba Community College teach courses that lead to two year education degrees. The faculty members use the Mississippi Articulation and Transfer Tool (MATT) to help students build a selection of courses that will transfer toward a four-year education degree. At the end of two years of full-time coursework, adults could be awarded an Associate of Applied Science in Early Childhood Education Technology, an Associate of Arts in Education of Deaf or an Associate of Arts in Elementary Education. Each program is taught at the college's Fulton, Mississippi campus. Education degrees and certificates at Prince George's Community College are awarded through the Teacher Education Department. Specific areas that degrees are awarded in include early childhood education, chemistry at the secondary education level and secondary education in English. Within one year, education majors could earn a certificate in fields like early childhood education and early childhood special education. For adults with a bachelor's education degree, the school offers courses that fulfill teacher re-certification requirements. There are two paths to apply for one of the credentials. Adults can apply through the Teacher Education Department chairperson. They could also work through an academic advisor. The education program at Santa Fe Community College is geared toward adults who want to teach students aged birth to the third grade. The school's early childhood education associate's degree helps adults to partially fulfill the academic standards required of early childhood teachers working in New Mexico public education system. If adults take the early childhood development certificate program, they can gain an understanding of what is expected during the longer, degree program. Credits earned during the certificate program could also be transferred into the two year degree program. Post graduation, students could work in a daycare, childcare center or elementary school. In addition to awarding two year education degrees, Mesa Community College awards certificates. Working teachers can also take classes that lead to a teacher endorsement at Mesa Community College. Associate degrees that education majors can declare include early childhood education, early care and elementary education. Certificates are available in early care specialist and instructional assistance. There is a child development lab and the Teachers of Language Learners Learning Community on campus to support education majors. Scholarships and a summer internship are also open to education majors. At Rio Salado College, the education programs prepare adults to teach at pre-kindergarten through high school. Associate and bachelor's degrees are awarded at Rio Salado College. Professional development training programs lead to teacher endorsements. Mentor and state certifications can also be gained by taking education courses at the college. Advanced training is delivered through teacher in residence programs which are available in early childhood education. Completion of residential programs fulfills many Arizona teacher certification renewal requirements. A background check and prerequisites are needed to start some classes. In person classes are taught at the Tempe, Arizona campus. Adults with existing teaching experience as well as freshmen who are embarking on a teaching career can pursue teacher education and early childhood multicultural education degrees and certificates at Central New Mexico Community College. Information sessions for new students are delivered in English and Spanish. After graduating from programs like the early childhood multicultural education program, students may receive a New Mexico Office of Child Development vocational certificate. During the online teaching and learning program, adults learn how to conduct and understand student assessments. Registration for all education programs must be completed by scheduled deadlines. Eastern Michigan University's College of Education has been preparing adults to teach at early, secondary and postsecondary levels for decades. The college was founded in 1849. It confers bachelor's, master's and doctorate education degrees. Several degree programs at the university are offered online. Accreditation for the school's education programs is from the National Council for Accreditation of Teacher Education. The Michigan Department of Education has also approved the programs. Students can gain firsthand teaching and counseling experience by participating in the university's school-focused counseling clinics. While working in the clinics, students work with children and adults. A major outcome of the education programs at the University of Toledo are to give adults the training to get licensed to teach in Ohio. The semester based school awards bachelor's education degrees. Generally, at least 128 semester hours are required for a bachelor's education degree. If students major in education, they need to keep a 2.5 GPA or higher to graduate. Fieldwork or clinical experiences are available. Before they get licensed, students must pass Ohio State Department of Education approved exams like the Praxis. They must also pass National Council for the Accreditation of Teacher Education exams. The chance to learn from experienced educators is available at Ashland University for adults who major in early childhood, secondary and advanced education degrees. While completing internships, students teach courses in real life to students in small to large classrooms. Types of bachelor's, master's and doctorate education degrees that adults can pursue at Ashland University include a Doctor of Education in Leadership Studies, a Master of Education in Educational Administration and a Bachelor of Science in Education. The bachelor's degrees are available in several specializations like earth science, physical science and chemistry. At Hofstra University, education is one of the academic hallmarks. The university has been teaching education courses since 1935, the year that the university was founded. Early childhood and childhood, foreign language education and physical education are types of areas that degrees are awarded in. Teacher education and leadership training programs are accredited by the Teacher Education Accreditation Council. Internships take place in schools that enroll students in classes ranging from kindergarten to high school. The university's courses are supplemented with clinical experiences, student teaching opportunities, seminars and workshops. Dual degrees and open houses are offered. 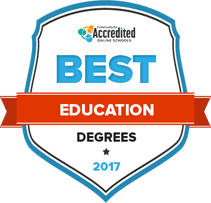 Nova Southeastern University's Abraham S. Fischler College of Education is fully accredited. Up to 20 degrees are awarded through the college. Online and on campus degree options can be chosen. Case studies, seminars, lectures, research work and team based projects are methods that faculty use to teach education majors. Undergraduate and graduate education degrees, all the way up to doctorate degrees, are conferred by the university. Specific concentrations that the degrees are offered in include elementary education, exceptional student education, reading education and early childhood special education. Graduate certificate programs are also taught at the university. At Western Michigan University, the first place for education majors to visit is the College of Education and Human Development. Adults can decide if they want to major in teaching specializations like elementary education, elementary professional education, early childhood special education or education and human development. It takes four years to finish an undergraduate degree. The university has one year graduate education certificates and two to three year graduate degree programs. Student employment services, success seminars and an academic resource center are among the tools that education majors can use to deepen their learning and improve their academic performance. Top academic performers in the SUNY Buffalo State education programs are recognized on the dean's scholars list. Students with bilingual skills can use their second language during field experiences where they teach students living outside the United States. This field experiences is gained by participating in the international outreach initiative. Graduate assistantships require a commitment of about 20 hours a week. Academics available in the School of Education include undergraduate and graduate degrees. Among the education and teaching degrees are a Bachelor of Science in Art Education, a Bachelor of Science in Childhood Education and the Master of Science in Adult Education. At Central Michigan University, undergraduate and graduate teaching and education degrees are awarded through the College of Education and Human Services. After enrolling in an education degree, students gain access to educational technologies, internships, guest speakers, lectures and research materials. Educational leadership, special education, elementary education and educational technology are some of the specialties that degrees are available in. Each degree emphasized a particular education or teaching area. The Master of Arts in Education puts an emphasis on real life topics such as training and development, integrated science, math and curriculum and instruction. Field learning opportunities and assistantships at both the undergraduate and graduate level are offered to education majors at the University of Washington. Early childhood and family studies and education, learning and society are types of degrees that adults who want to teach can pursue. The bulk of student support comes through the Office of Student Services. It is through the office that students can sign up to participate in research and teaching assistantships, student events and student organizations. Leadership opportunities in local schools are available for graduate education majors. Public policy, elementary school teacher, recreation centers and social services are types of careers that graduates can enter. A broad range of undergraduate and graduate education degrees are awarded at LIU Post. Adolescence education, middle childhood education, special education and teaching English to speakers of other languages are types of degrees awarded through the College of Education, Information and Technology. Depending on their specific major, students can learn how to teach children who have communication challenges or learning disabilities. They can also learn how to educate students who are academically exceptional. International students are accepted. There are dozens of student organizations that education majors can join. When choosing the proper teaching program or education degree, there are numerous factors to consider. Does the school prepare a student to become licensed in the state in which they really want to work? How much does the degree cost? Where is the school located? This search tool can help students narrow down their options by some of the most important criteria, and thus be instrumental in preparing that all-important ‘short list’ of best potential teaching and education degree programs. Interested in becoming a teacher? This is where you do your homework. The following education and teaching guides are designed to help aspiring educators get an informed start on their future career. What does it take to earn a teaching credential? What tests and qualifications are necessary? This guide explains it all. No matter the subject, going to school can be expensive. Aspiring teachers can find the financial aid and scholarship resources they need here. Some student loans might be forgiven if teachers agree to certain provisions during the first few years of their career. Here’s more on student loan forgiveness for teachers. Some students face unique challenges and turn to their teachers for help with them. This guide can prepare educators to work effectively with LGBTQ youth. This guide provides resources and advice for teachers striving to create inclusive environments for all cultures in the classroom. Those who have served in the military are in a great position to be role models for students. The Troops to Teachers program helps veterans transition to careers in the classroom. When someone thinks of a teacher, they likely see a person standing at the front of a crowded classroom, chalk in hand, lecturing about the subject. But that is just one small glimpse into the world of education. From early childhood education to special education to instructional coordinators and principals or superintendents, there are numerous jobs available for those who are ready and willing to put in the work to get there. It all begins with choosing the right degree path, then planning out further study in order to advance up the ladder in one’s chosen field. The following flowchart can help students see which programs might be right for them, as well as what it will take to get to the degree level and position they hope to obtain. work in a classroom environment? Do you prefer to teach life and social skills more than academic subjects? Is a career with an emphasis on management and leadership important to you? Would you like having the opportunity to teach students of all ages? Would you prefer to teach one subject, instead of all subjects? Are you interested in studying childhood from sociological and scientific perspectives? The special education teacher is a crucial component in ensuring that all students, regardless of disability or other needs, receive the education they deserve. Special education teachers might work with a wide range of students, from those who have mild learning differences to those with physical and mental disabilities across the spectrum. Their work in the classroom is not only about teaching, but about encouragement and acceptance as well. Those who want to make a difference in the young lives of their students can find what they need with an early childhood education degree. This prepares students to work closely with children at the various stages of their early education, where they can spot early problems, intervene quickly, help children get into the rhythm of a typical school day, and teach them the foundation of what they will need to know to be successful in the coming years. As students get older, they learn to question authority, struggle to find their own path, and grapple with the more challenging academic subjects that can lead them to a college education. Graduates of secondary education programs are prepared to teach students in grades seven through twelve, including those who might need additional help or guidance. In elementary school, students study the various foundations of the major subjects they will master throughout the coming years. They also begin to form opinions about school, family, friends, and the world in general. At this impressionable age, many students look to their teachers to set an example. An elementary education degree prepares graduates to teach students in grades one through six. Those who want to run the schools, write the programs, approve the curriculum, and deal with the public and the parents might be more satisfied with a degree in education administration. Depending upon the concentration, this degree prepares graduates to move into a variety of positions, including instructional coordinator, principal, superintendent and more. This program introduces students to the various developmental milestones for children, as well as how to foster that development. Graduates are prepared to work with students of all ages, but especially those younger children who are developing lifelong habits; catching problems with development at an early stage can help lead to a fulfilling life and successful school career. Hmm…maybe a different career path is for you. The job opportunities for teachers are growing at a slow and steady pace, with higher demand expected to rural and urban areas. The following charts offer an overview of teacher salaries and job growth across the nation. As the benefits of early childhood education are recognized by more parents, more parents are expected to put their children in early childhood care programs. In addition, childcare is usually a must for working parents. Early childhood development can be fostered by the proper education at an early age. As the need for early childhood education continues to rise, so does the demand for preschool teachers. Student enrollment at the kindergarten and elementary school levels is expected to rise in the coming years. In addition, teachers reaching retirement age will pave the way for new hires. Regular enrollment is expected to drive the increase of jobs at this level, as well as the retirement of longtime teachers. Job opportunities are expected to be better in rural and urban areas. Many schools report trouble with finding teachers to serve in the STEM areas, English, and special education. Those areas will be a primary driver of job growth. Those in urban and rural areas might see a distinct hiring advantage. Jobs are growing fastest at the preschool level (9 percent), where students need early intervention in order to enhance their development. Those who have experience working with students with learning disabilities and speech or language impairments might see the best opportunities. The increase in average classroom size will likely spur demand for more teacher assistants. Those who have some experience with special education students might see better opportunities. As more students are enrolled, more schools might be necessary to accommodate them; each of them will need a principal. In recent years, the best job opportunities have been found in the southern and western states. As schools work on improving curriculums, evaluating student progress and addressing teacher effectiveness, more instructional coordinators will be needed to focus on design and implementation of curriculums, accountability measures and mentoring for teachers. During the 2011-2012 school term, 56 percent of public school teachers had a master’s degree or higher. In private schools, 43 percent of teachers had a master’s or higher. Those who pursue a career in education tend to have a passion for learning and strong motivations to improve the lives of their students. Here are some of the biggest reasons why a teaching degree can be an excellent choice for those who fit this description. Every person who has ever attended school has that one favorite teacher that they will always remember fondly, and some credit their success in life to the lessons taught by that special instructor. Changing lives for the better might be one of the greatest rewards of all. Surveys in the U.S. have ranked teachers just behind military occupations as the most important jobs for contributing to society’s well-being. The world of teaching offers numerous opportunities for advancement. Many administrators began their careers as teachers and worked their way through a variety of grades before pursuing administrative degrees, eventually earning the promotion to the front office. With today’s high tuition rates, going to college can be tough. Teachers who want to eliminate student debt can do so through loan forgiveness programs. These programs often require teachers to work for a time in underprivileged areas; in addition to the money savings, these teachers might find that they hone their skills and find a greater calling through working with disadvantaged youth. Teachers are in high demand; the only catch is finding where that demand might be. Teachers who are willing to move in order to find the best jobs might find that they have numerous options available to them. A good teacher with an excellent track record will likely be able to find opportunities throughout their career. Institutions all across the nation recognize the value of a good teacher; that’s why there are numerous scholarships and grants available to those who want to pursue education degrees but don’t quite have enough financial means to get there. Wouldn’t it be wonderful to see that uncertain English student become a broadcaster on a nationwide network? How about encouraging that top-notch history student, only to read their best-selling book a decade later? Teachers can foster big dreams, and give students what it takes to make those dreams a reality. Studies of high-poverty schools have found that the primary factor in student motivation and achievement is the school, and more importantly, the teacher. For many teachers, seeing their students develop and learn can happen in a single semester. The look on a child’s face when they figure out how to do a math problem or the smile of delight when a struggling student finally notches their first solid “A” on a test can be exhilarating, for both the student and the teacher. Once a teacher has been in the workforce for a while and has learned the ropes, they can rest assured that their job is safe. Even if budget cuts come along and their job must be downsized, chances are there will always be another school district looking for great teachers to fill their empty spaces. Many teachers love the fact of a long, relaxing vacation – usually at least a month, possibly more – that happens right in the height of summer, when they can explore other parts of the world or simply stay at home and catch up on their reading. Some students face serious life challenges at a tender age. For them, school is a haven where they can learn, grow and dream. In a situation like this, teachers become the disciplinarians, motivators, counselors, and friends that students need in order to break free of the things that are holding them back. For quite some time, concerns about a nationwide teacher shortage has been getting national news coverage. Some states, such as Arizona and Oklahoma, have seen the shortage reach emergency proportions – to the point where the states simply don’t have enough teachers to run the schools. For instance, some schools have open positions with zero applicants, an indication that graduates from teaching programs are headed for greener pastures in other parts of the nation. For new teachers, the shortage can mean more job opportunities, but only if the graduate is willing to move for a great job, willing to take positions in urban or rural areas, and okay with working in a subject area that might be different from the one they trained for during college. It also helps to go into the job with eyes wide open: Many teachers have found that those first few years are much more difficult than they imagined, and become disillusioned enough to seek employment outside the profession. In most school districts, larger or more affluent schools get the lion’s share of funding, while rural schools tend to struggle to get by from one year to the next. This lack of funding can mean lower pay and less classroom support, including fewer supplies. Many teachers deal with these issues only until they find a better-paying and better-supported position in a neighboring district. Teachers in urban areas usually face the same problems as those in rural areas: a lack of supplies and support as well as lower pay. However, they may also face the added issue of ‘difficult’ or ‘rough’ schools. Many inner-city schools face serious problems with crime, truancy and the like, which can make teachers feel as though they do more disciplining than teaching. according to the National Center for Education Statistics. In schools all across the nation, the shortage of teachers for special education is nothing new. But there are other areas that are sorely lacking as well. Teachers who want to hit the ground running upon graduation might look to an education degree with an emphasis on the following subjects, so they are better prepared to jump into schools that need their expertise the most. Online learning is an excellent way for aspiring teachers to get the education they need in order to educate others. Since most teaching programs require a certain amount of supervised instruction, online education degree programs tend to be in a hybrid format: Students take most of their courses online, but fulfill their in-person obligations at a local school. Those who pursue an online education degree program might find that it enhances their understanding and appreciation of technology in the classroom, and might encourage them to create their own online opportunities for students once they have a classroom of their own. Signs of a teacher shortage are everywhere now. What is the implication of the shortage for those who are just graduating and starting their teaching career? There are three shortages at play currently in the education profession. First, there's the shortage of new grads for hard to fill STEM positions. Second, there's the issue of graduates from universities who aren't willing to move to where the jobs are. Often, the issue is supply and demand, but it's supply and demand relative to certain locations. Finally, there's a shortage of new teachers who stick it out. The requirements for teaching positions have become much more rigorous, and it takes someone truly committed to the field to stay. Is there a particular subject area, educational level, or job in the education field that is most promising for graduates today? There's always a need for teachers who are certified or endorsed in STEM areas (science, technology, engineering, and math). There's a shortage in the areas of foreign language and ESL or ELL (English as a second language or English language learner) endorsed teachers as well. Special education is a field with great turnover. The burnout rate for teaching students with disabilities is very high due to additional paperwork, feeling unsupported, or emotionally drained, but for people with the right background and outlook, it can be very rewarding. Anything else you might like to add about working as a teacher? People who are interested in education often have tunnel vision when it comes to what sort of position they might like to fulfill their interest in teaching. For example, most immediately look toward public education, but there are private or parochial schools, classical or Montessori schools and more. Additionally, teachers are often considered for jobs with publishers, accrediting agencies, state or government jobs, and various teaching organizations or associations, museums, and more. I would strongly encourage anyone interested in teaching and learning to consider looking not only for traditional positions but to keep their eyes and ears open outside school settings as well.